This is one recipe I craved for when I was pregnant, which we ate occasionally when we went to the Tea Stalls in Goa. The tiny Tea Stalls are popular in the villages(suburbs) and the college campus. The smell of freshly chopped coriander(cilantro) in the piping hot moong dal curry and hot pao(bread) is irresistible. 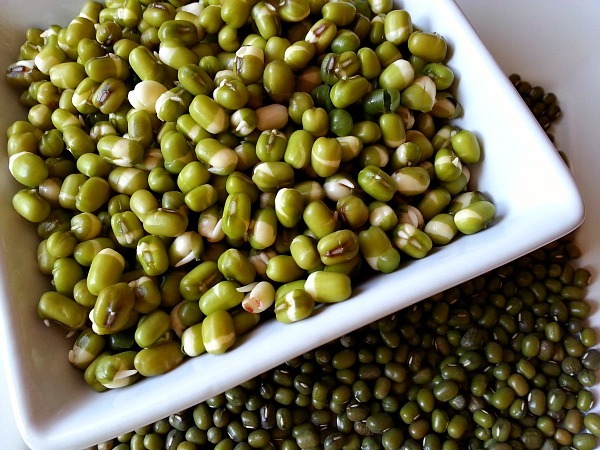 Moong dal or Mung Beans is getting popular and can be used for both savory and sweet Indian recipes. 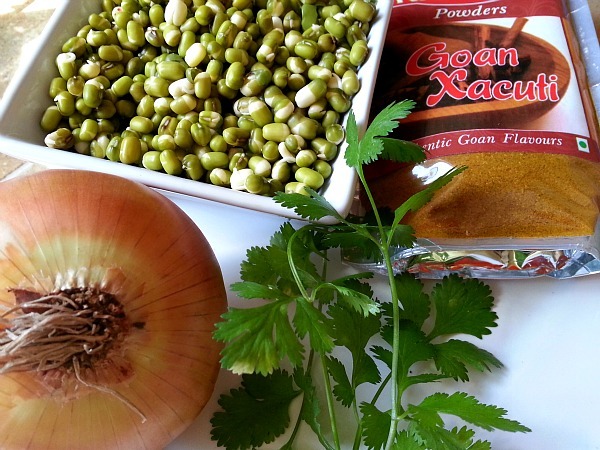 Goan’s do use moong dal a lot in sprouted moong salads,curries and desserts. For this recipe you have to soak the moong dal overnight so it can cook faster. Take 1 1/2 cup of moong dal, wash and soak it in 6 to 8 cups of water overnight. Add 1 tbsp of salt to the water. This is what it looks like the next day. Heat oil in a pot, saute the onions till translucent. Add the xacuti masala and saute for 30 seconds. Add the soaked moong dal, water and salt to taste. Cook covered on medium heat for 30 minutes by checking and stirring occasionally. Add 1/4 bunch of finely chopped cilantro once’s done. 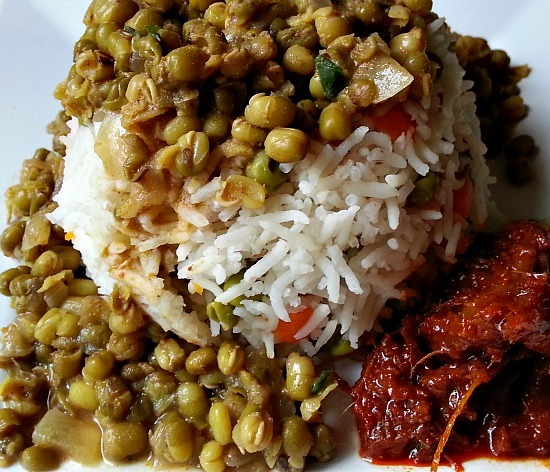 Serve with rice, bread or chapati. Indeed, this is delicious. I enjoyed some of this thanks to my hosts in Panvel. I’ve got to try this!! Looks simple yet tasty!! I’m following the blog now, look forward to seeing more recipes!! Greetings from London! You’re welcome Nandini!! I like Indian vegetarian food and often cook vegetarian food, predominantly during Lent.. I’m sure as a Goan you understand that. I also am a fan of curries/dishes with coconut milk and flesh. .. I will look out for more recipes featuring coconut..
Yay! What state do you live in in America? Cool.. I have a family member there.. In North Hollywood.. I take it that its hard to find Indian products there? I understand that some states haven’t really taken to Curry..
-Curried Goat.. I have this recipe on my site..
Also if you have time have a look at redrebelremarks.wordpress.com.. Its a friend of mines site which is a poetry, discussions and stories.. The site is fairly new but have a look at what’s there and feel free to comment! I sure will check it out :-). Thanks for letting me know. I need to take an Indian cuisine cooking class as I’ve never used many of these foods. I’ve acquired a taste for curry when we went to Hawaii. Now I use it quite a bit!! This sounds so good. I wrote a Southern recipe cookbook that covered 4 generations but I don’t even know where to start. Everything sounds so good. I love veggies. Where would you start if you were me? Wow a recipe book….that is an awesome accomplishment Debbie :-). You got me scratching my head as to what to recommend :-). A good start would be the less complicated, least ingredient recipes and then move to the more complex. Since I am not a very patience person I cook quick alternatives to the traditional Indian food version. A good Dal Recipe would be a good start I think 🙂 Hope this helps. We have a couple of Dal recipes in the Trim Down club recipes online, but I haven’t tried them yet. But I think I will now! Thanks. Have you ever tried curry in quinoa with coconut flakes and shredded carrots, dried cranberries, and sautéed onions. Put it in a 8×8 oven and put your meat of choice on top. Just get it hot and the meat cooked. Yummy!! I’m loving curry!! I love rice also but I’ve switched to brown rice , sprouted whole grains , grass fed stuff, Healthy healthy!! 🙂 I do love quinoa though. It freezes beautifully! Thank You so much Chitra :-). I am truly honored. You have been amazing Nandini and been supporting for every recipe with your likes and feedback. You are so welcome Chrita :-). Thank you for your kinds words. Thank you Jayeeta for the nomination. That’s really kind of you :-). I sprouted some moong dal ages ago and put it in a salad. It was really lovely to have homemade beansprouts. I still have the rest of the packet of moong dal in the cupboards and I love the idea of this and the fact that I would only need to start preparing them the day before. Yes Corina, the only prep work is the soaking overnight. and if you drain out the water and cover it with wet paper towel for another day you will have them fully sprouted that you can use for salads. I love them in salads and I’m going to have to sprout them again too. yum, thanks I just pinned this recipe! Thank you Trouves, appreciate it much :-).